In this page addition practice worksheets, you can find set of 15 worksheets for practice. Each question paper will contain 10 questions. For each question you will find four options. You can just type one of the answers from the given choice and immediately you can check whether you have answered correctly or not. What is meant by addition? Addition is a mathematical operation that represents combining collections of objects together into a larger collection. It is signified by the plus sign (+). For example there are 3 + 2 apples—meaning three apples and two other apples—which is the same as five apples. Therefore, 3 + 2 = 5. Besides counting objects, addition can also represent combining other physical and quantities using different kinds of numbers: negative numbers, fractions, irrational numbers, vectors, decimals and more. How does the symbol look like? If a boy goes to shop and buys two types of articles,say Article A and Article B.In Article A he bought 20 and in Article B he bought 30. To find the total number of articles that he bought we have to add them. Why do we have to practice these worksheets? You may use these addition practice worksheets to improve your knowledge.We have created these worksheets for the students who are in lower grade.Each question papers have 10 questions and you can check the answer simultaneously.You can also get the score of the test immediately on the score board.This will encourage the students who are try these worksheets. 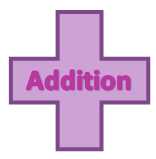 To know more about addition, you can just click the following links to get clear idea about adding two numbers.